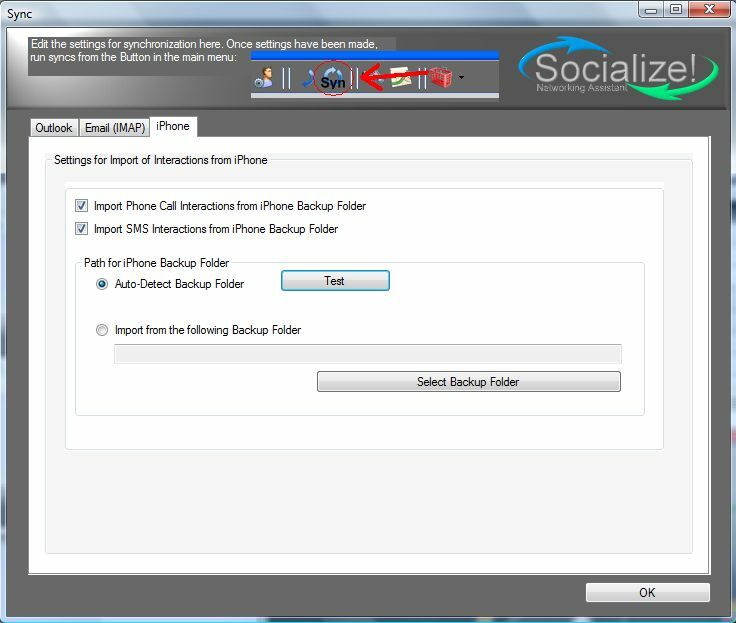 ima-pim is now able to import your phone calls and SMS from the Backup-Files that iTunes generates each time you connect your iPhone with the PC. Note that the option to encrypt your iPhone Backup Files must be turned off (as in the default settings). In the window choose the tab 'iPhone'. Select SMS and/or Phone Call Interactions to be imported each time you start a sync. ima-pim can auto detect the location of your iPhone backup files. For this feature please check 'Auto-Detect Backup Folder'. You should test whether ima-pim is able to locate the folder by clicking the 'Test' button. I recommend the Auo-Detection setting. However, if your backup folder cannot be detected, you may enter the path to the folder manually. The backups should be located in a path like \Apple Computer\MobileSync\Backup\. That's it. Whenever you start a sync in ima-pim, the interactions will be imported from your iPhone. Not that only those interactions will be imported that match with a contact in ima-pim (for each phone call or SMS, ima-pim looks for a contact with the corresponding phone number. If a matching contact is found, the interaction is assigned to this contact). Notice: This function is only available in the Professional Version of ima-pim However, you can test the functionality in the free version.